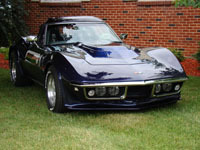 C3 Corvette Forum - Can't type on the forum??? C3 Corvette Forum › How to Join the Forum › How to Register › Can't type on the forum??? Trouble typing on the forum. I think google ads has something to do with it. I'm pretty close to doing away with them. If you have a problem X out the ads. If I have to I'll just right if off as a business expense as I can't stand google anyway. Maybe Google is why it locks me out of the forum if I make more than 2-3 posts within a few minutes? Seems to be better when I use OPERA.